BISHKEK, May 30. /ITAR-TASS/. 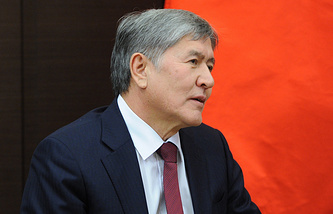 Russia will allocate $1.2 billion to help Kyrgyzstan to adapt its economy for accession to the Customs Union, which also includes Belarus and Kazakhstan, Kyrgyz Economy Minister Temir Sariyev said at a news conference on Friday. Russia will provide $500 million to set up a fund to ease the joining process for Kyrgyzstan’s economy, Sariyev said. Russia will also give a $500 million preferential loan on the terms of the International Development Association, and $200 million more to implement a roadmap of the country’s accession to the union, he said. Kyrgyzstan, which made a decision to enter the Customs Union in 2011, will join it in 2015 under the roadmap approved by heads of the union members on Thursday.